It’s 10am on your first day off work in six months. You’re just about to watch the whole season of your favorite television program, when the phone rings. It’s a “financial advisor” at some bank, and he wants to know if you’re happy with your investments. The last thing you want right now is to get trapped in a sales call. But you have to admit you’re not happy with your returns. (Is anybody ever?) After two more questions and answers, it’s clear this guy is following his script to the letter. If he’d listened to your answer to the last question he’d already know the answer to this one. While he’s rattling off talking point #4, you’re looking for a way out. After ten minutes, you feel like you’ve been more than generous, and end the call as graciously as you can. He wasted ten minutes and didn’t make a sale. You’re ten minutes behind a 15-episode season. An hour later, the phone rings again. It’s another financial advisor. (Can you believe it!) He also wants to know if you’re happy with your investments. But before you can explain that you just went through this with one of his competitors, you realize something is different. There isn’t just one voice on the other end of the line. There are two. You just got a phone call from two people! The last time you got a call from two people it was your mom and dad calling to wish you a happy anniversary. But you’ve never gotten a business phone call from two people before. At a minimum, you’re intrigued. You get through the first two questions and something else is different. As sure as the last guy was doggedly on script at this point, these guys are clearly off. Your answer to question two was rare and unexpected. But they handled it adeptly. It led them down an atypical path to a suggestion you’d never heard before, and that they’d never given before. You’re impressed. Oddly, they don’t actually try and sell you anything on the phone. What they ask is to meet you in person next week, so they can better understand your life goals, fears, and aspirations. You agree, and set a date. You’re now another fifteen minutes behind schedule, but convinced that would prove to be the most profitable thing you’ll do all day. For the financial advisors, it was time well spent too. If you’ve ever gotten such a call from two people before, chances are you’re a client of Merrill Lynch. And your financial advisors are Pledger Monk and Larry Chance. Why? Because their technique is as unusual as it is successful. Why is their team approach more successful than the typical solo cold call? Several reasons. First, it’s unusual, and therefore interesting. Second, it’s flattering to have two people interested enough in you to call you together. Third, it’s hard enough to hang up on one person. But trying to hang up on two people seems twice as rude. Most importantly, however, you don’t want to hang up on these two. That’s because unlike the solo caller on autopilot, these guys are really listening to you. It’s obviously impossible to listen to someone while you’re talking. But it’s almost as hard to listen when they’re talking and you’re trying to figure out what to say next! With two people on one end of the phone, at least one of them is always listening. That’s why they quickly went off script when your answers went out of norm. And that’s why you felt comfortable with them. When Pledger and Larry meet with their clients, it’s the same story. You get both of them. Both listen to your dreams, your concerns, your needs. Between them, they don’t miss a thing. Together, they identify the best solution. Invariably, it’s one that neither of them would have come up with alone. Sure, it takes twice the effort of Merrill’s human resources, but it delivers more than twice the returns. Pledger and Larry are two of Merrill’s top producers in the state of Arkansas, generating over $2 million in revenue for the firm each year. Their two-for-the-price-of-one approach is a key reason why. Of course there’s no reason this team selling strategy should only work in the financial advisory business. It could work in just about any industry that requires personal selling. If you want to encourage a breakthrough in your sales organization, or if you’re just trying to get people to collaborate a little better in the office, share the story of Pledger and Larry, and see what happens. My bet is you’ll be happy with your investment. But there’s a second lesson to learn here. Sometimes a single story can teach you more than a whole semester at business school. In this case it was about a sales technique. But it could have been about anything. Imagine how much less effective the lesson would have been if delivered textbook style instead of via a story. You probably wouldn’t have even gotten this far reading it. Experience has always been the best teacher. But a good story is a close second. All other forms of communication leaders use at work—like email, policy memos, and PowerPoint slides—are a distant third. Master the art of storytelling, and you’ll be a far more effective leader no matter what line of work you’re in. 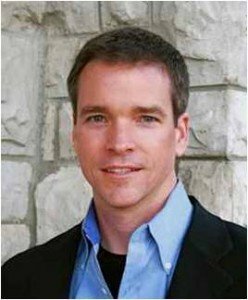 – Paul Smith is director of consumer research at The Procter & Gamble Company, and a corporate trainer on leadership through storytelling. 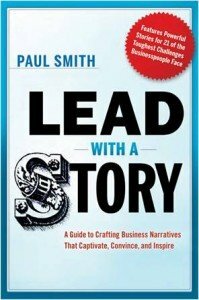 He is the author of Lead with a Story: A Guide to Crafting Business Narratives that Captivate, Convince, and Inspire. You can ﬁnd him at www.leadwithastory.com and on Twitter as @LeadWithAStory. Great post! Stories are so valuable because your audience can relate. With our Business Builder Program of professional business coaching we invariably lead with identifying Core Values of the business and the next step is crafting at least one story that illustrates that Core Value. These stories are valuable for creating interest during a networking event, during a sales call and for leadership/management team meetings. Great Post and I look forward to discussing your book on my blog. When salespeople embrace stories , they instantly help buyers understand how you solved problems for someone else and build confidence you can solve their problems as well. Thanks Mark. Let me know when the blog discussion is. I’d love to participate.